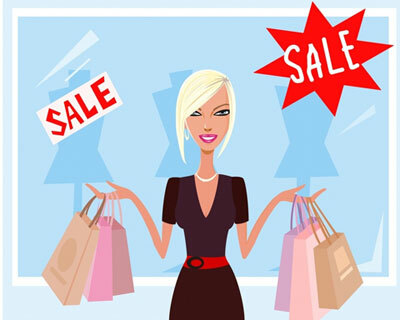 How To Shop Smartly During SALES ??? | The Shopaholic Diaries - Indian Fashion, Shopping and Lifestyle Blog ! The Sales are soon to get over, have you visited your favorite store to grab great deals yet or not?? I know this post has been a little late, as sales in India had started in mid-January itself, but well Better Late Than Never !!! Make a fix budget and carry enough cash and debit/credit cards along so that you don't repent not buying something you liked when money gets over. Carry along a big Handbag / Tote bag in which you can keep all the items you shopped for, rather than having to carry different shopping bags. Go to a mall or store keeping wide variety of brands, so you can make a choice between different items you want. Make a list of basic things you want to purchase, so that you focus on finding them as the first few things when you enter a store. Buy quality classic wardrobe items like black pants, trench coat or little black dress. Go during weekdays and at a time, when the store and dressing rooms would be free. In India, afternoon timings are the best to shop, as most people prefer going to shop later in the evening. Plan for a long day because chances are, that you are not the only shopper going bargain hunting. Wear comfortable clothing so that you you can move around the stores picking out things freely, and prefer wearing top and jeans if you plan to buy a pair of jeans , t-shirts etc (It would make it easier in the try room). You need to either decide to purchase an item or completely forget about the item because it will likely be sold out soon after you leave the store. Avoid carrying a credit card, because that would let to over indulge and do impulse purchases which you might repent later when you'll have huge debts. Only buy clothes that fit there and then, don't buy a clothing item just because it doesn't have your proper size, but you think you can alter it or wear it once you loose weight. It's totally a waste of money. Whenever there is an end of season sale, be a little cautious because as the Season goes the goods which are displayed might not be apt for the next season. Don't waste time thinking on a single clothing item, like whether it would go with my this dress and so on. Be quick in your decisions; as you might loose some other better deal waiting across. Don't buy anything or everything just because the product belongs to some LUXURY brand you can't afford otherwise, but might never wear or use it in future. Don't ignore minor defects like missing buttons, marks or stains etc. ; the shopkeepers say they can be corrected easily, but its not always feasible. I guess that's all what you should keep in mind while going shopping out in SALES. Rest do take a friend or partner whose choice you trust and are compatible with, so that they give you an honest opinion of the chosen items. Sales usually do have a hypnotizing effect on the people who love shopping. There are many shoppers who do not buy goods the entire year because they wait for sales. The best way to shop in bulk without worrying about heavy bills is to shop when stores and shops have sales. But always think well before you enter the stores which have sales. Remember, it is not a bargain unless you will wear it and you need it. in Do's and Dont's, how to do smart shopping during sales, sale shopping, tips on how to shop during sales. Nice post!! :) Will definitely keep in mind the dos and the dont's next time i go shopping during sale!